This was regarding an article published, on August 12th, 2015, by ESPN hockey writer Corey Pronman, when he ranked the organization/farm systems of all 30 NHL teams. Right now, I'm going to rank the top five prospects in the Pittsburgh Penguins system that were drafted/signed out of college. Maguire is one of the Penguins' goalie prospects, and as of now he is the only goalie in the system that was signed/drafted out of college. A BU product, Maguire signed his first NHL contract - a two year, entry level contract - on April 4th, 2016. 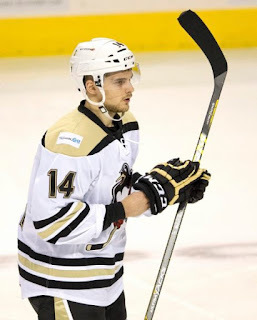 With Matt Murray's promotion to Pittsburgh and Brian Foster's return to Wheeling, Maguire became the backup in Wilkes-Barre/Scranton to Tristan Jarry. He only played 13 minutes in the AHL - in which he stopped all 4 shots he faced, in relief of Casey DeSmith - but he has a chance to shine this year in either the AHL or the ECHL. It's likely he'll back-up Jarry, or split time with Jarry, in the AHL with the Baby Pens. "Sean Maguire is a hybrid goaltender who possesses a solid frame and very good overall natural talent. He is athletic with good lateral movement, but he also has a calm demeanor. Maguire has a tendency to maybe overplay the puck or scramble around too much in his crease. He is considered raw at this point, but has the size and athleticism to potentially develop into an NHL caliber goaltender." 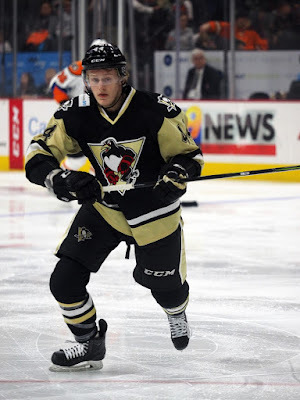 Teddy Blueger comes from Minnesota State University, and signed his first NHL contract with the Penguins on March 22nd, 2016. During his time with the Wilkes-Barre/Scranton Penguins, he didn't exactly start on the right foot, failing to register a point in his first 10 games, and only 1 point in his 10 playoff games. He has a chance to do better this year, though. With a stacked offense (on paper), he'll likely have much better linemates to play with. He was often on the fourth line with players who aren't exactly goal scorers. "Blueger is a Latvian forward who has played in North America since he was 14. He is a skilled, two-way player who possesses a great hockey IQ. He also plays with a fair amount of physical flair, and is not afraid to get dirty in the corners or down low. He is also very good at faceoffs. Physically, Blueger must continue to get stronger, but he has added a fair amount of strength since he was drafted in 2012. His skating is by no means a red flag but upgrading his explosiveness would make him a significantly greater threat offensively." Originally a Washington Capitals draft pick, the Pens recently signed the free agent on August 19th, 2016. 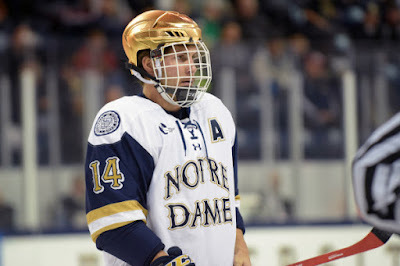 The Italian-born Di Pauli comes from the Univeristy of Notre Dame - just as Pens prospect Jeff Taylor, in addition to Bryan Rust - where he just finished his senior year and graduated. A center at heart, Di Pauli joins a stacked Baby Pens team, where he will likely have a full-time role under head coach Clark Donatelli. "He's an undersized center with good defensive skills who just started to really develop his offensive game in the past couple seasons. 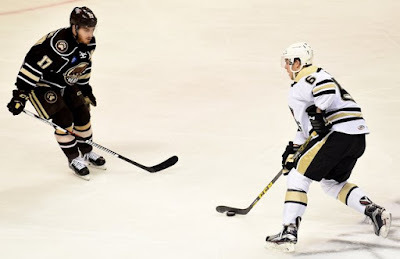 I'm not sure if he's gonna play in WBS as a center or winger but I feel he's best suited in the middle." Ethan Prow, a product of St. Cloud State, was signed as a free agent by the Pittsburgh Penguins on March 29th, 2016. In the 2016-16 college hockey season, Prow was: a Hobey Baker finalist, named to the All-NCHC First Team, named the NCHC's Player of the Year, Defenseman of the Year, and Offensive Defenseman of the Year. When he made his way to Wilkes-Barre/Scranton after signing his first NHL contract, he only played a handful of games (5, in addition to 2 playoff games) where he managed to record his first AHL (and first pro-hockey) assist. This was understandable however, as head coach Donatelli was far into the season and already had a trusty d-core. If Prow doesn't earn a spot in Pittsburgh's training camp, he'll definitely have a full-time role this time around, in Wilkes-Barre/Scranton. "Prow is an undersized, skating defenseman who moves the puck well and has the instincts to facilitate the attack on the power play. He may struggle in one-on-one battles with bigger, strong forwards but uses his skating ability and anticipatory instincts to take away passing and shooting lanes. Prow skated for St. Cloud State and was one of the top defenseman in college hockey as a senior in 2015-16, signing a two-year entry-level contract with Pittsburgh as an undrafted free agent in March 2016. 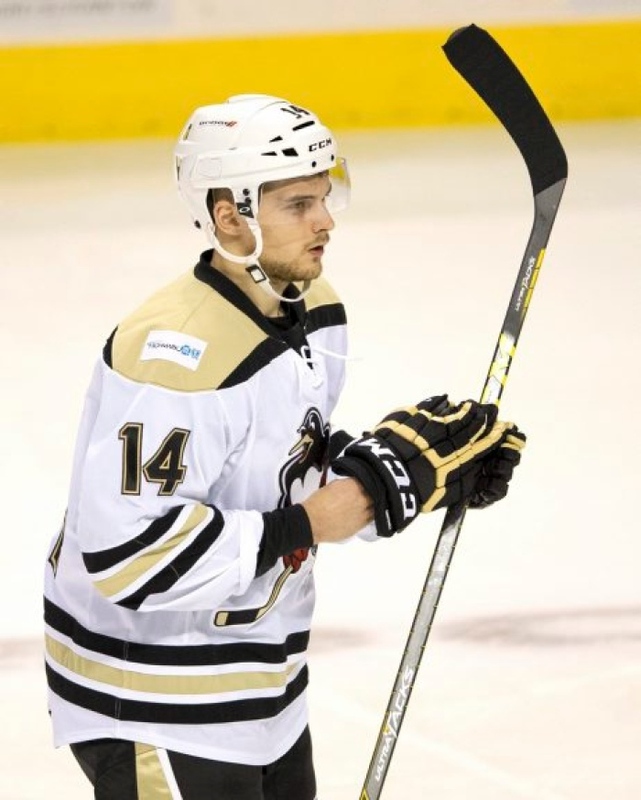 He will challenge for an NHL roster spot in training camp and in all likelihood begin his pro career with the AHL's Wilkes-Barre/Scranton Penguins in 2016-17. The 23-year-old projects as a middle pairing attacking defenseman with power play potential." If I'm being honest here, this wasn't that hard of a decision. Guentzel easily ranks #1 atop this list, and that is in no way whatsoever an insult to the other players on this list. Through his three seasons at the University of Omaha-Nebraska, Guentzel only failed to register over a point per game one time, and he was just 3 points under the amount of games played. The Penguins 2013 draft pick signed an amateur tryout contract with the Wilkes-Barre/Scranton Penguins on March 22nd, 2016. In his first 11 games with the Baby Pens, he managed 2 goals and 4 assist for six points. When the AHL playoffs started, however, Guentzel decided to become one of the best performers of the postseason. In a measley 10 games, the first-time AHLer exploded for 5 goals and 9 assists, accumulating 14 points in the playoffs. He had the most assists of any rookie in those AHL playoffs. On May 23rd, 2016, Guentzel had signed a 3-year entry level contract with the NHL club. Expect him to challenge for a roster spot in training camp. "Guentzel is an undersized, yet highly skilled forward who possesses a hockey IQ. The biggest knock on him has been his size, but Guentzel possesses the requisite skill, speed, and grit to play a top-nine role in the NHL. He is a particularly effective player off the rush, and uses his speed and vision to create offensive plays. He will need to add considerable strength before he gets to the point where he can contribute to the NHL level, but he has the skill and hockey sense to one day make an impact." Thanks for reading! Comment below which prospect you're most excited for! Can somebody explain the status of Casey DeSmith at WBS. He's never listed as a Pens' prospect yet he took the net from Jarry during their playoff run last year and has since signed a contract with WBS. DeSmith signed a 1-year AHL deal with WBS this summer. I suspect he is the one who would be seeing time in WBS along with Jarry so Maguire can get some experience and game action in Wheeling. The article also states that Maguire replaced Jarry for the 13 minutes at the end of the season which is incorrect; Maguire replaced DeSmith when Casey was removed for precautionary reasons. I haven't noticed much talk about DeSmith which is odd considering his ceiling. Perhaps it is because he was not drafted that people tend to turn a blind eye? That being said, many organizations are making smart moves these days by signing undrafted goalies from college after they have matured and developed (See MTL: Lindgren, PHI: Lyon, VAN: Garteig). Thanks. Any idea how that AHL contract works in relation to the big club? I've never seen his name listed as "In The System" and he wasn't in town for the rookie camp a couple of months ago. I'm not sure if that makes him some kind of free agent where another team can come in and sign him to an NHL 2 way deal or if the Pens have first right of refusal? Kind of interesting to note that according to Capfriendly.com both Maguire and Jarry are signed to more expensive 2 way contracts than Murray. Pete, I do not know enough about contracts to even give an opinion... sorry. Looking at the salaries of all the goalies, they make little sense at this stage but later on in their careers, I'm sure it rights itself. Or someone has a really good agent! What constitutes "In the System" is also puzzling. Perhaps you need to be drafted, have and NHL deal or have a multi-year deal in place... none of which DeSmith has. That being said, he was signed by Wheeling and has an AHL contract now with WBS so it's hard to believe he isn't in their plans. I just noticed he was part of the goalie training held in New Hampshire recently with the PIT, WBS and WHL goalies yet isn't part of the roster for the rookie tournament this weekend in London, ONT. So I am as confused as you as to where he stands. One minute he's starting in the playoffs while injured over a healthy Jarry and the next he isn't listed as a prospect. He certainly earned that contract though and probably more.